The Grande Rue has provided souvenirs to Mont St-Michel visitors for centuries! 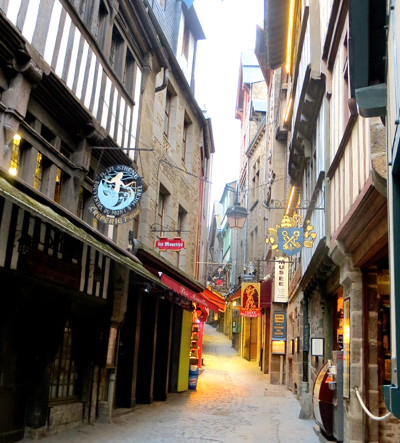 The Grande Rue, or Main Street, of Mont St-Michel is unlike any Main Street you're used to. 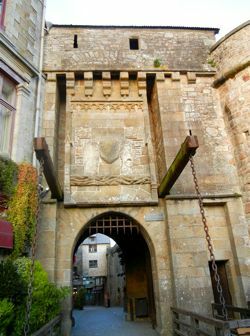 Narrow and made of stones, it is lined on either side with houses, shops, inns and restaurants that date from the 15th and 16th centuries. Early morning on the Grande Rue, before the tourists have arrived. Early pilgrims bought medals and other souvenirs from shops on this street, and today's visitors don't lack for shopping opportunities. 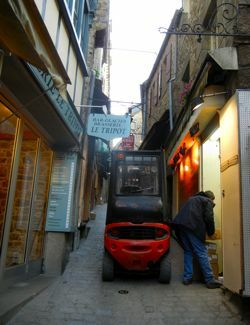 During the day, when tour groups are at Mont St-Michel, the shops are busy and the street can be barely passable. If you are fortunate enough to stay overnight, you'll experience a much quieter Grande Rue in the evening and early morning. You can't miss the Grande Rue. Enter through the main gate (Porte de l'Avancée). You'll see the Tourist Office on your left, and on your right the entrance to the Grande Rue. The Grande Rue climbs steeply up through the town and eventually leads to the Grand Degré or Grand Staircase and the Abbey. You'll also find some of Mont St-Michel's museums here. And the Grande Rue, like much of Mont St-Michel, lends itself to photography. It's fun to see how they handle the challenges of providing food, delivery of household products, and services such as garbage collection in these narrow streets! Watch out for tiny vehicles like the one shown below right. If you're exploring rather than heading to the Abbey, you have the option of going up some stairs on your right to reach the ramparts, which offer lovely views of the Bay. You can also take any number of small ways and stairs on the left to explore the steep "streets" and back alleys. And it can't be said too many times: wear comfortable shoes and be prepared to walk and climb over steep, sometimes rough, surfaces. But it's well worth it. Mont St-Michel and the Grande Rue. to businesses on the Grande Rue.